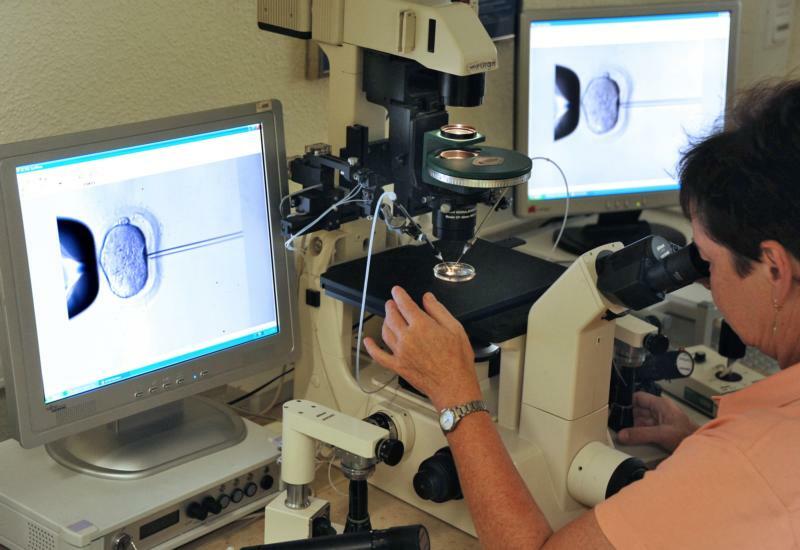 LEVITTOWN, Pa. (CNS) — A California state judge’s ruling that a now-divorced couple’s five frozen embryos must be destroyed is an example of doing something that technology allows without considering all its aspects, according to medical ethicists. Estimates of the number of embryos in frozen storage range from “hundreds of thousands” to several million worldwide. White told Catholic News Service he would be comfortable putting the number at 1 million. The center is opposed to the destruction of the embryos created by in vitro fertilization for anesthesiologist Mimi Lee and Stephen Findley, when they married. They are now divorced. The couple had signed a release at the time directing that the embryos should be destroyed if they were to divorce. But Lee said she did not understand the agreement to be binding and thought she could change her mind. California Superior Court Judge Anne-Christine Massullo in San Francisco ruled Nov. 18 the embryos must be thawed and discarded. According to articles in the Los Angeles Times, Lee was diagnosed with breast cancer days before the couple’s 2010 wedding, and they decided to create embryos through IVF before she underwent treatment that might impair her fertility. She and Findley separated in 2013 and divorced earlier this year. Lee, 46, asserts that the embryos represent her last chance to have a biological child; Findley does not want to have children with her. Lee’s lawyer did not return a CNS request for comment, but Lee is reported to have said she would appeal a ruling against her. Massullo’s ruling is in line with most other rulings on the subject across the country, according to a Nov. 19 article in The New York Times. Judges in at least 11 states have ruled in estranged couples’ embryo-custody cases, and in at least eight of those states the ruling has been in favor of the party who did not want the unborn babies brought to term. In Pennsylvania, Illinois and Maryland, however, courts have awarded the embryos to women who argued, as Lee does, that the embryos created with ex-husbands or ex-boyfriends represent their only chance to have biological children. There is no federal law regulating these issues. Fertility specialists in the U.S. regularly create numerous embryos using IVF and insert several at a time into the mother’s body, in the hope that one or two will successfully implant in the womb and come to term. Remaining embryos are stored in case the attempt is a failure or more children are desired in the future. White, of the Center for Bioethics and Culture, said that IVF has an 80 percent failure rate for each attempt worldwide and that the failure rate is 70 percent in the U.S. He noted that Germany has a law that only three eggs at a time may be inseminated and all must be inserted — Father Pacholczyk wrote in his syndicated bioethics column that Italy has a similar law — and these countries therefore do not have the problem of what to do with stored frozen embryos. Father Pacholczyk said that several alternatives to the destruction of unwanted frozen embryos have been suggested, including donation for scientific research, donation of the frozen embryo for adoption by a woman who wishes to have a child, or indefinite preservation of the embryo in the frozen state. The church, Father Pacholczyk said, has no position on frozen embryos, although a 2008 statement by the Vatican Congregation for the Doctrine of the Faith, “Dignitas Personae” (“The Dignity of a Person”) comes down firmly on the side of the dignity and worth of the human embryo. “It needs to be recognized that the thousands of abandoned embryos represent a situation of injustice which in fact cannot be resolved,” it says. Among the document’s conclusions are that the embryos may not be used for research and may not be used as “a treatment for infertility” which latter the bioethicist said could seem to rule out the adoption alternative. Father Pacholczyk told CNS that his own opinion is that only continued preservation of the embryo would be allowable. In his syndicated column, he has written that frozen-storage facilities are analogous to orphanages, and the fee that parents pay to continue to keep the embryos there is not unlike the money parents spend to care for children who have been born. The embryos could be kept until they die and then be buried, rather than being disposed of as medical waste. This topic touches on science, philosophy, theology, law and morality. I am not an expert in any of these disciplines. Nevertheless I have thought for some time that one flaw in the SCOTUS decision , Roe vs Wade, which legalized abortion is that a fertilized and implanted embryo is treated as “property”. Some women argue “its my body and I have the right to an abortion.” This position relegates the status of the unborn in the womb to “property” and the woman the owner of this “property.” So there is a parallel to slavery wherein the slave owner had the ownership of “human property”. My own view is the father and mother have a “legal responsibility” for their progeny but I stop short of saying a parent or parents “own the child or own their children.” That being said, there can be medical situations where the life of the mother is threatened by the presence of an unborn child, but I’m not a physician. This in vitro fertilization business is even more complicated. It is interesting that the Church has no position on frozen embryos.